The terrific view looking from Chapman Point in the Ecola State Park at the waves crashing onto the Coast in Oregon, USA. 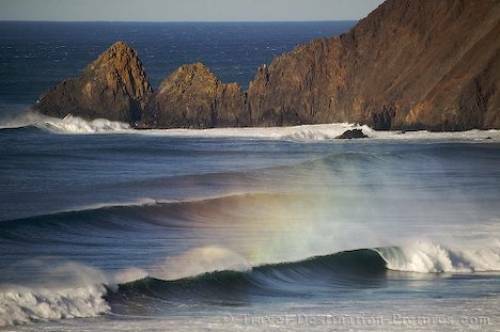 A pretty rainbow seems caught in the ocean spray lingering just above the waves. A great place to watch as Pacific Ocean storms whip at the Coast of Oregon is the Ecola State Park which is a Lewis and Clark National Historical Park. Picture of ocean waves rolling in along the Oregon Coast of the USA.